A community group used the Kids First Allen Story Map Journal as part of a campaign to spur passage of a $272 million school bond measure for Allen Independent School District (AISD) in the Dallas suburb of Allen, Texas. Created using the Esri Story Map Journal app, the Kids First Allen Story Map Journal was embedded onto the Kids First Allen organization's website. It helped educate voters about why a school bond was needed, school construction plans, and the potential tax implications. The Story Map Journal also was used for nearly 40 live presentations during various meetings throughout the district and was part of a direct marketing campaign to get out the vote. The school bond measure passed overwhelmingly on November 3, 2015, with 75.7 percent voter approval. Esri partner Datastory Consulting created the Story Map at the request of David Hicks, who owns the David Hicks Company, a commercial real estate brokerage and development services firm in Allen. Hicks is a strong supporter of the Allen school system and a member of Kids First Allen, a community organization that campaigned for the bond measure. "Creating a Story Map allowed us to share lots of information to a tremendous amount of people and rally the community around their local schools," said Hicks. Interactive maps in the Story Map showed, for example, where a new science, technology, engineering, and math (STEM) center would be built at Allen High School and the general location of a future elementary school. Short videos also were embedded into the Story Map Journal. One video gave voters an overview of the rapid growth in student enrollment in the school district in the last 20 years and promised no tax rate increase to fund the new bonds. The other video explained the meaning of STEM education and how it emphasizes skills such as problem solving, communication, research, critical thinking, collaboration, and creativity. Hicks credits the Story Map Journal with helping to clearly explain to voters the importance of passing the bond measure, which, at $272 million, was the largest bond to date in the district. "Our Story Map made information easier to understand, especially for such a complex bond," said Hicks. "We were able to help organize ideas and tell a story rich with content." AISD will use the bond money to expand facilities and improve programs in an area that's seeing growth. Student enrollment, which has doubled since 1989, is currently 20,780 and is expected to grow 2.25 percent over the next five years. That is three times the national average. The bond will help AISD grow to meet that demand as well as help children prepare for college and twenty first century careers by building a STEM center that will serve up to 2,000 students each day. Esri Story Map apps, including Story Map Journal, Story Map Tour, Story Map Series, help organize complex ideas in a way that is meaningful and engaging, because story maps provide interactive access to data through the lens of a map. 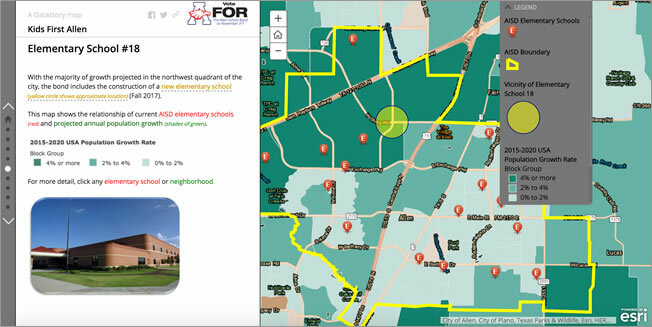 Viewers of the Kids First Allen story map can scroll through information and see on a map exactly what is being proposed for the school district, and where. The number of families living in Allen, Texas, will swell by almost 3,000 over the next five years. Hicks chose the Story Map Journal format because it is easy for anyone to navigate and provides a way for viewers to step through information in a logical fashion. As viewers are reading information, they can click hyperlinked text for more detail while maintaining context of the larger story. For example, viewers can better understand why a new elementary school is needed when they see on a map that the areas of highest population growth in the district are currently lacking schools. The bond measure will fund construction of a new elementary school. The Kids First Allen Story Map Journal maps the location of facilities where construction is scheduled to occur, such as the Lowery Freshman Center, Allen High School, and a new elementary school. Pop-ups on the maps list exactly what type of work will be done at each location. For example, Allen High School will get an 11,000-square-foot addition for use by the orchestra, band, and percussion groups. The Kids First Allen Story Map Journal provided important facts to the community. Informing citizens is important, especially as communities generate plans for the future and seek participation from citizens in shaping and approving those plans. Listen to a podcast with Hicks discussing the Kids First Allen Project with Karen Jagoda on DigitalPoliticsRadio.com.